To understand how this scavenger hunt works, go to Sharkbytes' Scavenger Hunt - Start Here. Today's clue is: "palindromic watercraft"
As a reminder, you need to go to the blog post linked below, read the post and look for a word that answers the clue. It will be "hidden." In other words it won't say "this is the word for the scavenger hunt." Today's blog post to explore is The Everyday Adventurer: Bzzzzzzt! See Sharkbytes' Scavenger Hunt - Start Here for complete rules, and prize list. Today's clue is: "old hose nose"
Tomorrow I drive on to Valley City North Dakota. Today's clue is: "sniffy hose"
Today's clue is: "accessory for the small house of the crescent moon"
Today's clue is: "the coach, the wolf and the lost hiker all found this handy"
For those of you coming to check out the scavenger hunt, don't be confused. This article has nothing to do with the scavenger hunt, but I need to post the winners of the July contest. 5. You should go to the right because the diagonal lines angle downward toward the road surface. These are placed on guardrail ends (sometimes), and bridge abutments. 6. As you can see, the sign just says "no swimming," but it is indeed a very dangerous place because it is right beside a dam. I think Vanilla gets the most creative answer award "Beware of the alien that is jumping out of water." And if I'm allowed a little namedropping, I felt honored to have a comment from Daisy the Cat on V-8's passing. Daisy is a very busy kitty. R emember those scavenger hunts from youth group where everyone split into teams, took a big paper bag and a list and went off to scour the town trying to return by a certain time with everything on the list? I suppose the innocence of such activities is gone even in small towns. It sure was fun to knock on your former 2nd grade teacher’s door and ask for a slice of bread or a nail! Nearing the end of the event and becoming desperate, we would knock on doors of strangers! Of course our very small town could accommodate such frivolity. Everyone pretty much recognized what was going on and no one worried about us kids being harmed or mistreated. Well, we can’t recapture that exact ambiance, but anyone who wants to may grab a virtual paper bag (better get a really big one), and go on a scavenger hunt here for the next 5 weeks while I am gone hiking. There are a total of 19 clues, leading to 19 items you’ll want to collect in your virtual paper bag. All entries will be due by email to jhy@t-one.net by midnight, EDT, on August 31, 2009. If you think you are in contention for a prize, but are concerned that others might beat you out, here’s the tiebreaker: Take all the items in your paper bag and write a story using as many of them as possible. It can be zany (probably it would have to be!). If the tiebreaker is required the best stories will be selected by independent judges (who these are is to be determined). This game seems to have generated a fair amount of interest. So I’m trying to make the prizes decent. As far as cash value they aren’t necessarily in order. I’ve tried to position them by potential value to bloggers. First Place: one year of a 125x125 banner ad on either this blog or Just Throw Money. (The decision as to which blog the ad will appear on will be made based on the nature of the winning blog- my decision, not negotiable.) Projected ad views- well over 30,000. Second Place: one month of free advertising for your blog on Adgitize. This is being donated by Ken Brown the owner of Adgitize. This is a $14 monetary value, and generally results in several thousand hits for a blog- very good advertising value. Ken operates Adgitize on a stable and sound basis, in a friendly atmosphere. I really appreciate doing business there. Fourth Place: 12 credits (or as they are switching to dollar values- $3.00) worth of advertising on CMF ads. If you are not a member, joining is free, and I will transfer 12 credits to your account. This can be “spent” by the winner to advertise on any other sites in the CMF system. Many blogs host ads for only $.50 a month, with $.25 being the lowest cost ad. This means that you could possibly receive 12 months of free advertising. Blogs with more traffic usually cost more, and estimated banner views will totally depend on the blogs selected for advertising. Sixth Place: one month of a 125x125 banner ad on both this blog and Just Throw Money. I’ll be away hiking for most of the time this contest is running. I may have internet access more often than on some hikes, so there may be an occasional live post too. We’ll see! Remember that I said yesterday that I went to lunch with a friend? That friend is Ester, who came to visit for two days. One could question our intelligence for doing a visit like this just a couple of days before I leave for a hike, but hopefully I can still get out the door on time. She helped me pack food, sort my gear, and do some business odds and ends. And we had a great time. 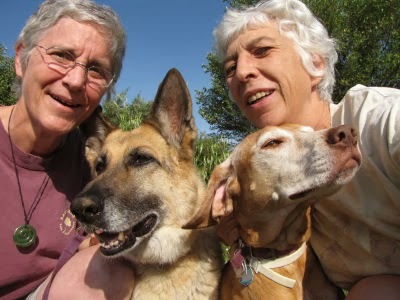 Her dog, Matty, is the same age as Maggie and the dogs have known each other since puppy days. But Maggie is totally a-social with other dogs. I don't say anti-social because she isn't aggressive, she just ignores other canines. So it was a bit of a feat to get the two dogs this close together, get everyone posed, hold the camera in one hand and shoot the picture. But we like it! Contest rules for the scavenger hunt will be posted tonight, and don't forget to enter the July contest before midnight EDT. And for those of you waiting for the secret of the Clammy Ground-Cherry... it hasn't given it up yet! I hope it will be still showing when I get home, or that I might find some in Minnesota. I didn't mean to set you up for a complete cliffhanger! 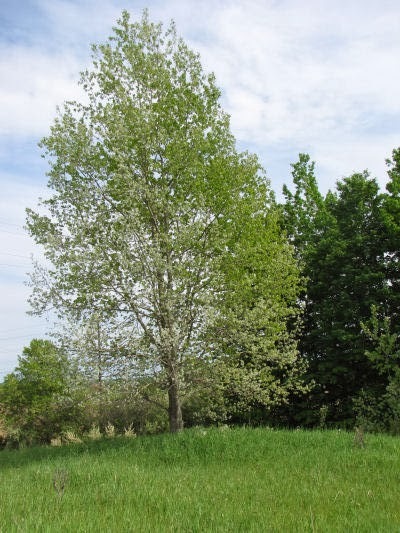 What Happened to the White Aspen? 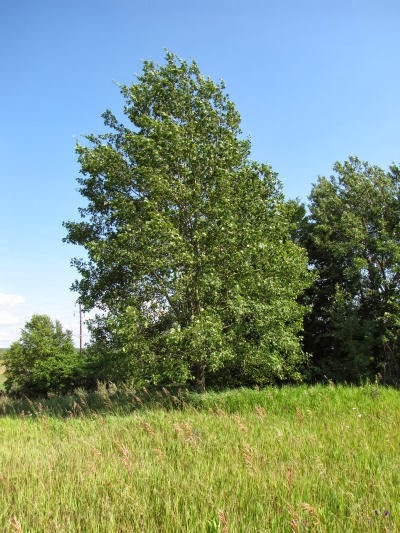 Remember the White Aspen tree, Populus alba, that I showed you this spring? They young leaves were like white velvet, but I said in summer it would look as green as any other tree. Well, I decided to show you that today. Actually, this is a poor substitute for what I should have showed you, but I left home without my camera to have lunch with a friend. Can you believe that we found a bizarre ornamental tree that neither of us had ever seen before, Michigan lilies in bloom, and a doe and spotted fawn that were just POSED for portraits. But, sigh... no camera, and probably no time before I leave to even go picture the lilies. So what you get is a tree. Here is the same tree, in June, and yesterday. You can see how much the color has changed. If my dad were alive he would be 105 years old today. Catalpa trees always make me think of Dad's birthday. 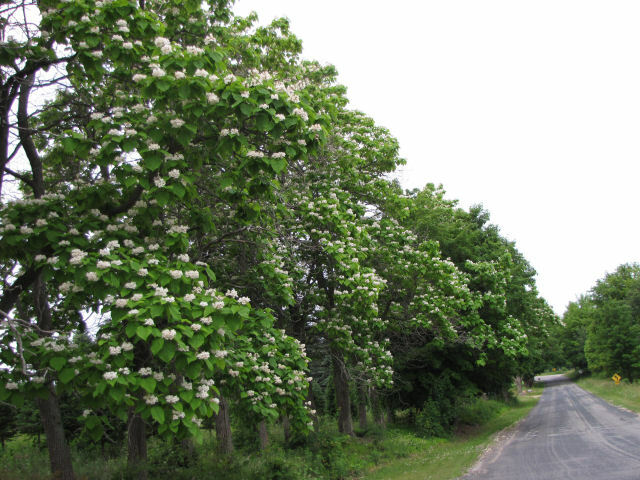 This is actually a bit odd, because most catalpa bloom during the first week of July, which is when I took these pictures, just off a road I traveled doing the paper route. 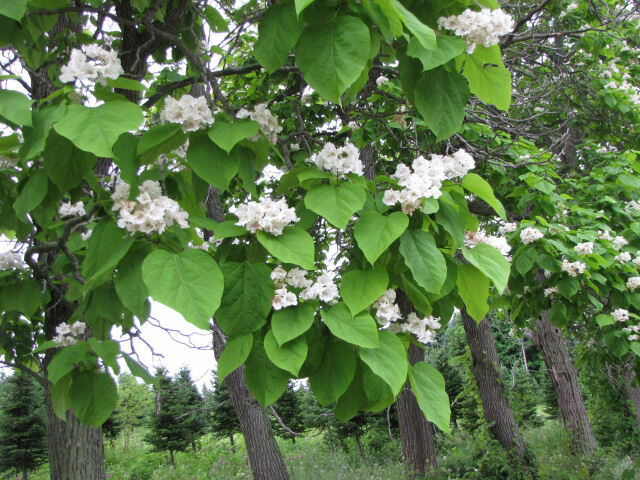 But at the house where I grew up, we had a catalpa tree that bloomed later than any other catalpa I've ever known, and it was always blooming on Dad's birthday, July 22. 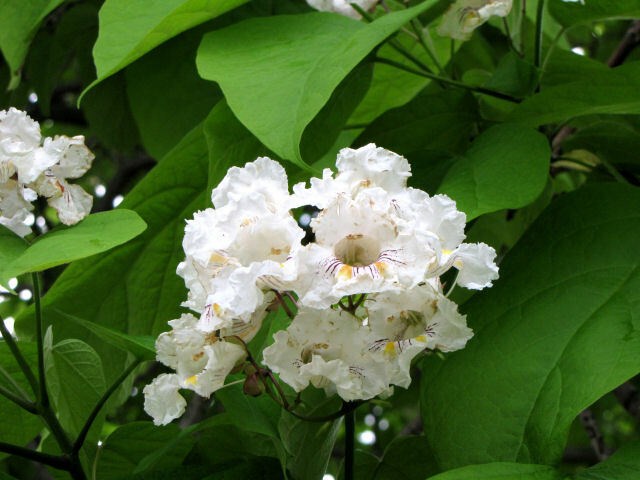 The catalpa has become naturalized in North America, although it was originally an ornamental. The blossoms and leaves are both huge. No real botany lesson today. I'm just enjoying the memories of my dad. Here we are near the end of the month again! This time, no vocabulary... just pictures to look at and answer the questions. The theme is summer recreation... they all have to do with information or safety (some travel safety). Email all answers to me jhy@t-one.net before midnight EDT, Friday July 24. Have fun! Admittedly this game caters to folks in the United States, but anyone should be able to guess at most of the answers and even look up the others. I confess that I thought up this game because I did not know what #4 was myself and had to go exploring! There are 6 basic questions, but with multiple parts there are a total of 11 responses needed. 1. What does this sign mean? 2. There is a uniform flag system for beach conditions in the United States. What do each of these flags mean if seen flying at a beach? Just in a few words- I’m not looking for the exact language of the code. 3. You are in the car, someone else is driving while you are napping. You wake up and this is what the road ahead looks like. Are you on a two-lane highway, or one side of a divided highway? How can you tell? 4. What does this sign tell you is ahead? 5.You are in the car, driving at night. You jerk awake, realize you are in the grass and your headlights catch this sign dead ahead. On which side of that sign should you drive to hopefully avoid an accident? How do you know? What kinds of structures have these warning signs posted on them? I wanted to make the title, "Why These Birds are in the Wrong Tree," but I have no idea! The first bird is, of course, an American Robin. It's sitting in a large maple tree. Nothing very unusual there. While I was trying to get a good picture of it, another bird flew in. This one is a male goldfinch, quite a bit smaller than the robin. They are both males, and they actually got into a bit of a discussion about who should be using that half of the tree. Meanwhile, yet another visitor stopped by. This is a Cedar Waxwing. These are elegant, slim, gray birds with a crest, and in between the other two in size. He had the good sense to choose the other side of the tree. Here they are again. And why do I think they are in the wrong tree? Because the maple tree has no fruit for the birds to eat, and in my yard is a tree that should be covered with birds at this time of year, and it's that mulberry you've seen before. For some reason, the birds aren't flocking to it this year. Go figure? None of the things I wanted to show you today really turned out, but I keep working on labeling the pictures from the May hike in Minnesota, so I thought I'd show you a few more of those. I really gave that hike short shrift. 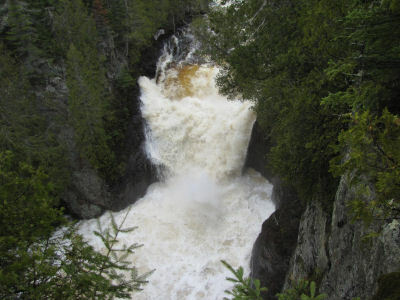 The first picture is Devil's Kettle on the Brule River in Judge Magney State Park. We had only walked about 20 minutes from the very start of the whole hike before we came to this exciting feature, where the water pours down into a rocky bowl and churns around before heading down to the river. So this view is readily accessible to most people. This view, however, is only for those who are willing to work for it! 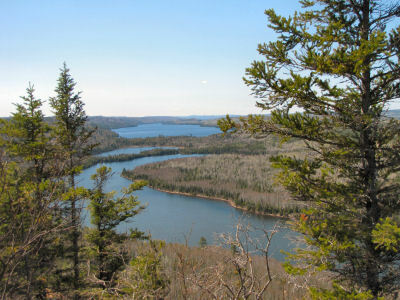 I think that the Border Route has some of the most spectacular scenery anywhere along the North Country Trail, but it takes some serious hiking to reach it. On the right of the picture is Canada. We are looking west down Rose Lake. The small lake in the middle is Rat Lake, followed by the blunt end of South Lake. Finally, just to point out that not every location on the trail is rugged and intimidating, here is our campsite the night following that spectacular view. 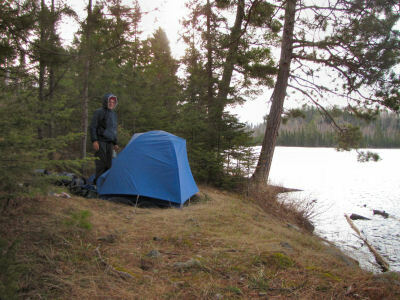 The four of us had three tents, but Marie and I had this lovely spot by the calm waters of Topper Lake. At that lake I saw (but couldn't catch a picture of) what I think was a Common Merganser duck. I'm not so great with waterfowl, but it was a large white duck with a skinny neck, dark head and a black wing tips. It was awesome! The upcoming Minnesota trip won't have such spectacular sights every day, but each trip has its own special secrets! See Home- the Hike was Great! 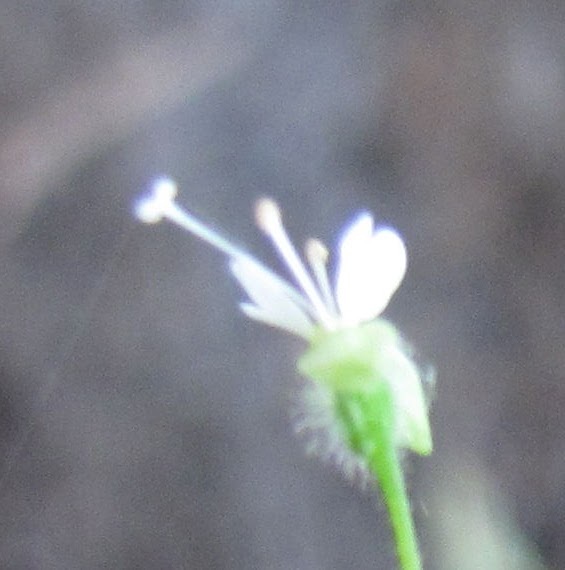 I've continued to try to picture these tiny flowers, and all I can tell you is that I can't yet make this new camera do what I want it to. For now, this is the best I can get. 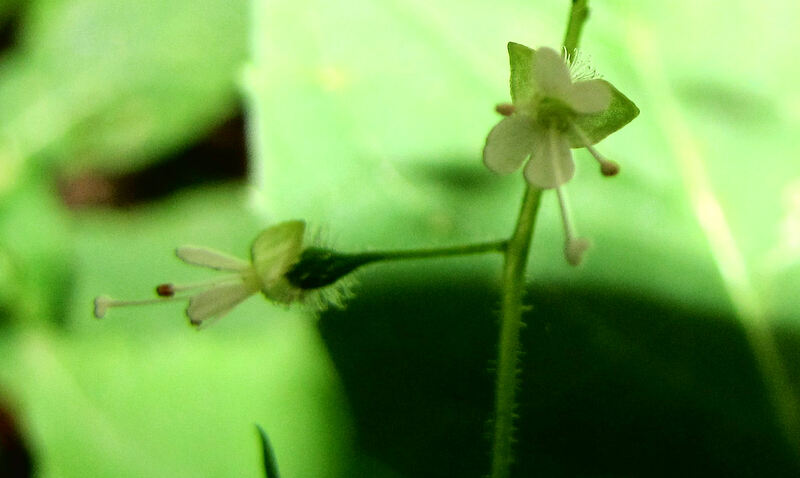 Each flower is less than 1/8 inch wide. Let's do a little botany. 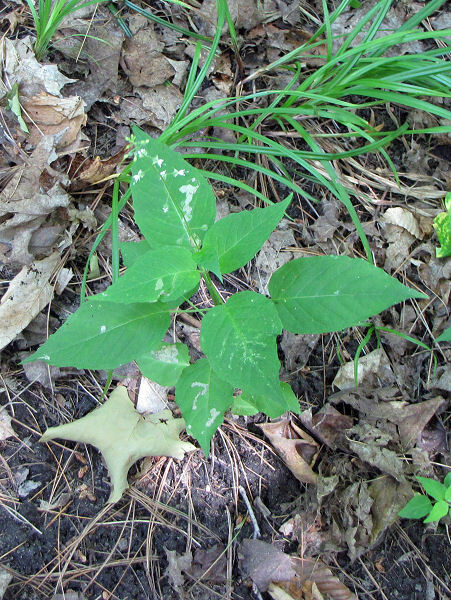 Common names often are not helpful, and calling this a nightshade is odd. Most nightshades are in the Solanaceae, yes those tomatoes and the clammy ground-cherry. The family for this plant, Onagraceae, is the Evening Primrose family, and flowers in it are usually easily identified by four petals and the stigma in the middle with a cross shaped tip. This plant just has to be different! It has two petals, although each is deeply lobed. The stigma has a two-part tip, rather than four-part. See the yellow arrow pointing to it. Now I'll have to try to get a closeup of the evening primrose to show you that typical cross-shaped stigma! Sorry for the crummy pictures, my friends. I guess this is a day for poems. I've been wanting to share this one for some time. But this morning, while visiting Grampy and You, I was pushed to actually do so. Grampy regularly features children's poems from older books. And then, what a surprise to see that Lin also posted a great poem at Duck and Wheel with String. Let me digress a moment. I was steeped in poetry as a child, and I loved it! (Still do) The picture above is the cover of my copy of A Child's Garden of Verses, by Robert Louis Stevenson. This edition is illustrated by Eulalie Osgood Grover who was best known as the creator of the "Sunbonnet Babies." I can hardly choose which was my favorite book as a child, but this one would surely have been in the running. Anyway, Grampy shared a poem called "The Circus." It's not from this book, but from another favorite book of poems I had as a child. The exotic nature of a circus just naturally led me to thinking of this poem. And between my grandmother and poems like this one, I have a terminal case of Wanderlust. Enough talking... I've scanned the illustrations that appear in this edition with the poem. Enjoy! In all the town no spark of light. Of the old Egyptian boys. 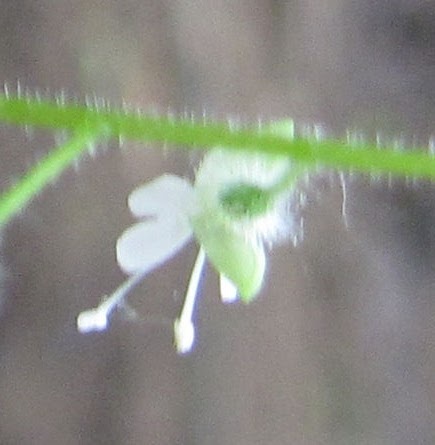 I tried to take better pictures of the Enchanter's Nightshade today, but they aren't in focus. I checked the Clammy Ground-Cherry, but it's not ready to give up its other secret yet. 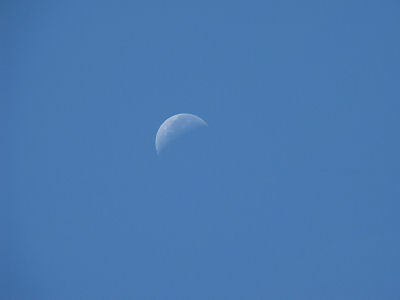 But I also looked up in the western sky this morning, almost mid-day, and there was the moon! I snapped its portrait. It seems more fantastic to me now than it did back then. Hubby and I were one year married, just out of college. We were on the leading edge of the baby boomers entering the work force. The world was being conquered by computers, medical breakthroughs and the discovery of the double helix of DNA, the wonders of quantum physics... Anything seemed possible! The night it all happened was for us the eve of the second long-distance bicycle trip (for a group of teens) that my husband led. The equipment truck was packed, the kids were spending their last night at home before boarding the bus to the starting point in the morning. We had a few quiet minutes to watch the historic moment at the home of some friends. We were so poor we didn't even have a TV! To me-- young, sure of my invincibility, and born just in time for the computer age-- it all seemed exciting, but yet pretty much a normal progression of events. Older now, and less sure of everything, I've wondered at the simplicity of the universe in 1969. The trip to the moon was charted with plain Newtonian physics, plotted by a Cray Supercomputer. The Cray of that year was the equivalent of a 286 processor! When was the last time you used something as wimpy as a 286 to even calculate your taxes? Maybe in 1995? That world was predictable to all but the most esoteric of scientists who were just cracking the shell of particle physics and indeterminacy. It was quite easy, before that night to think of the moon as up, and high school students had never heard of a down quark. I often think how that night must have seemed to my grandmother. She died in 1973 at the age of 91. That puts her birth date at 1882. She was born in a world where the scientists were building internal combustion engines. She went to market once a week in a horse and buggy, and yet she lived to see that moon walk. Her generation witnessed what seems to me to be the most sweeping changes in everyday life, accomplished by the engineering technology of humans, in the history of mankind. Well, it has been proven that the world is an uncertain place. We've always known it, really, it's just that there are mathematical equations to back up all those feelings now. But somewhere, behind all that uncertainty, I still believe in the goodness and truth of One who understands it all, and for that One there is only certainty. This plant has an unfortunate name and a secret. It is the Clammy Ground-Cherry. How's that for an endearing moniker? It's not clammy, and it's not a cherry, but it does grow near the ground. You'll find it in open fields- either in bare spots or hidden in the grass- but it definitely wants to be in the sun. I'll tell you one of its secrets today. Did you notice any flowers in the first picture? Probably not. But when the leaves are spread a little you can find these pretty yellow flower bells hanging underneath the leaves. Here's another secret! Look at how different the flowers look on the inside. I just have to show you that close-up! This plant is actually a relative of the tomato. Did you guess that? It looks a little like a tomato. That whole family is Solanaceae (SOUL-an-EH-see). This member has fuzzy, slightly sticky stems. You can see how fuzzy even the flower is in the closeup. Finally, in this picture some of the fruits are beginning to form. So this story is not over yet. Stay tuned... the rest of the secret will be revealed in due time. Here's an update on the monthly contest and the upcoming big Scavenger Hunt. It looks like my hiking schedule is morphing just a bit. All plans are still a "go," but the timing has shifted. So here is how everything will work. First of all, the end of month short contest will run from July 21-24. It won't be vocabulary this time... I think I've found a fun pile of questions that relate to summer fun. Prize- as usual, a one month free ad on this blog. As to the Scavenger Hunt. There are indeed 19 blogs participating, and I have the entries from all on hand already. If anyone else wants to get in on it, get in touch with me quickly! (jhy@t-one.net) It will begin on July 25, with complete rules and prizes posted July 24. A new clue will appear approximately every other day, although there will be a few in a row to get them all in before the end of August. Anyone can jump in at any time- you could wait till the last day and search for all the clues if you wanted to. I will have occasional internet access during this hiking adventure. So once in a while I hope there will be a "live post" from the trail. But I don't know if I'll have time to respond to comments very much or visit other blogs. We'll see. See you later with a nature post for the day! Today I was pretty cranky. I was stomping along on my walk, thinking about all the perceived or even real injustices of the day. But many years ago I decided that those are not the kinds of thoughts that help me, or make friends. Really, would all of you great blog friends come here to read me whine every day? I don't think so! So I said to myself, "Self, just stop and look around and see what's here today." 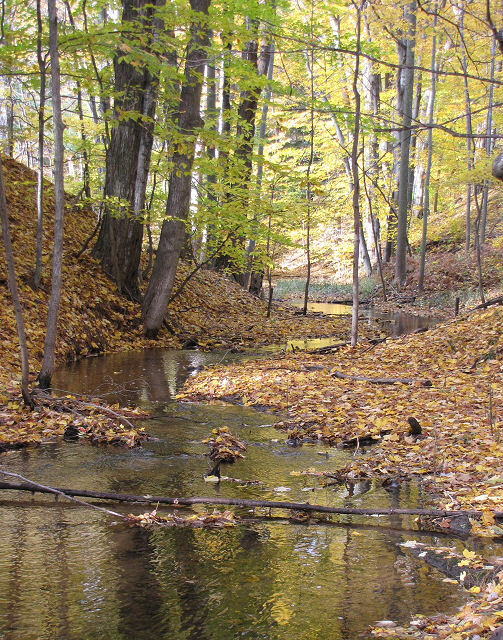 Of course, the first thing is the creek itself, in the slanting sun. I wish it had an interesting name, but it doesn't have a name at all. 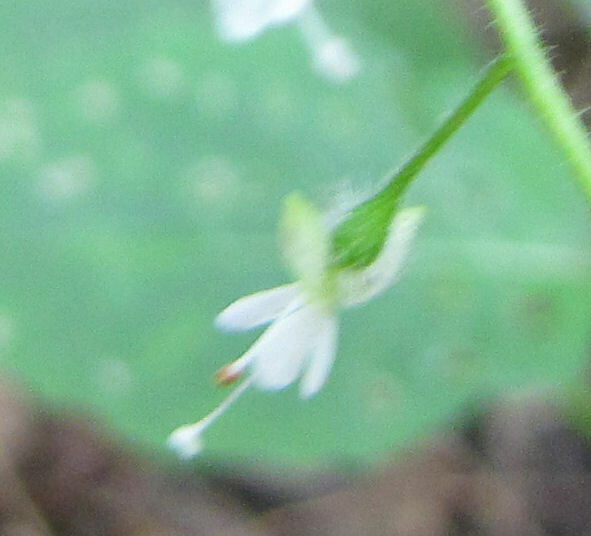 First I noticed that the Enchanter's Nightshade, Circaea lutetiana, was blooming. 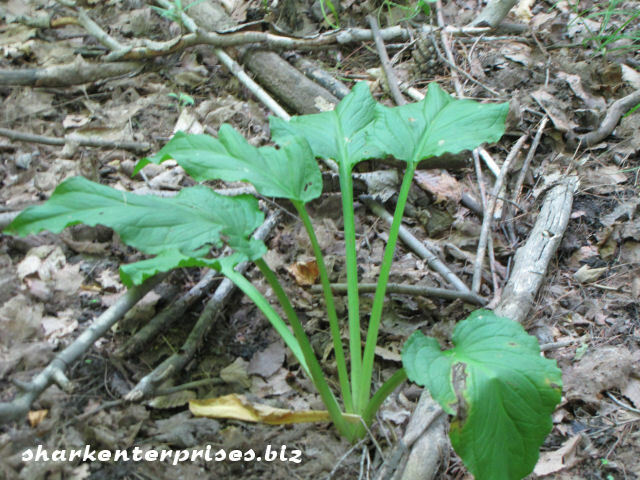 Ratty showed a picture of this plant on his post about Poison Ivy. See the small white blossoms? 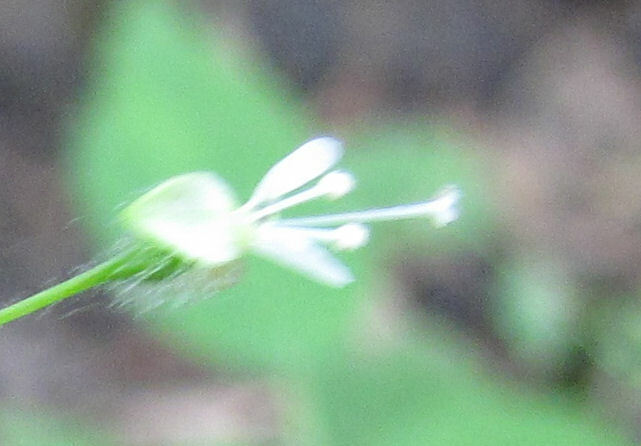 I'll try to get a close shot of the blooms; they are tiny but interesting. Next I saw that there was some skunk cabbage here. Who could guess that these big leaves are the same strange plant that I showed you in April. In the summer it doesn't look very odd at all! 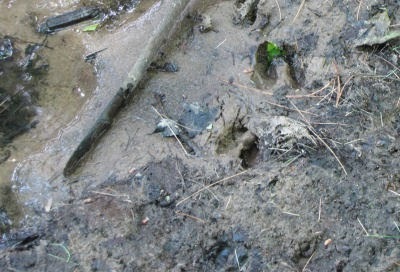 Finally, so many of you have enjoyed the animal tracks, here are some deer tracks in the mud. They are so common here that we hardly ever notice them. And there you have the whole reason for My Quality Day! There is always something worth the time to observe and enjoy!